Captain Robert Samuel Flood M.C. Robert Samuel Flood was the son of Maria and Robert James Flood. Robert was born about 1891 in Ashfield, Cootehill. County Cavan. The family were farmers. Robert was a student at the Royal School Dungannon between 1903 and 1905. Robert worked at the Bessbrook Spinning Company in Armagh as an assistant manager. His uncle, Robert Scott, was the managing director. 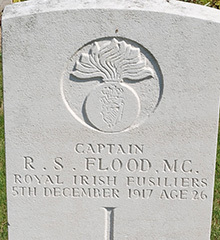 At the outbreak of war Robert Flood enlisted with the 9th Battalion of the Royal Irish Fusiliers. Private Flood quickly rose through the ranks. Robert Flood was awarded the Military Cross for gallantry at Ypres on 16th August 1917. 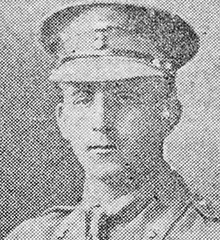 Captain Robert Flood was serving with the 9th Battalion of the Royal Irish Fusiliers when he was killed in action by shrapnel on the morning of 5th December 1917.